There’s an awesome little wax pencil that gets a lot of use in my studio. If you’ve ever worked with little gems and especially flat backed beads, you’ll be familiar with this VERY inexpensive tool. It’s called a Wax Pick-Up Pencil and you can buy them singly or by the set on Amazon. The other day while sculpting I was reflecting on the movie, Jurassic World. Many of you know that I have a “thing” for dinosaurs. I was fondly remembering the uniqueness of Blue (the velociraptor) and that special blue stripe that tells him apart from his other raptor buddies. Well – I too wanted my new creation, a shark in honor of shark week (get the tutorial here), to have a stripe, but a glitter stripe. How in the WORLD was I going to do this? If I used my finger the glitter would end up in places I didn’t want it to go. Well, the answer was sitting right in front of me the whole time … my wax pencil. So, as a curious mind always seeks new perspectives … would this work? I’ve never seen anyone else mention this … hmm….. I put some glitter in the top of my glitter jar and pressed that little wax pencil into the glitter … do you know what happened? Shrapnel (what I named my shark) had a perfect glitter stripe from his nose, all the way down his back. By placing the tip of the wax pencil in the lid of the glitter jar, it picked up just a few pieces of glitter, but I could place them exactly where I wanted them without getting glitter all over my shark. The effect was exactly what I was going for! Hurray! Sprinkle some of it on a hard surface. (The lid works great). Press wax pencil into glitter, it will pick up a few tiny pieces. Very gently touch wax pencil to clay but DO NOT PRESS DOWN or you will make dents in your pieces. The glitter has enough static it will magically cling to your clay. 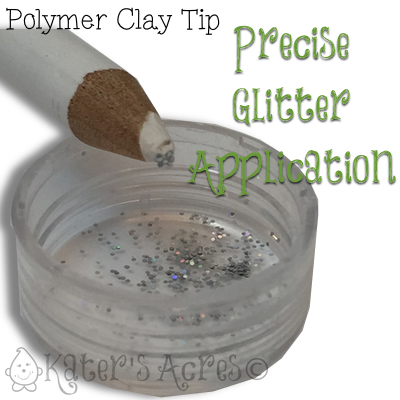 Rub your finger gently over the glitter to flatten the metallic effect and secure the glitter to the clay. Finish & bake piece as usual. Let me know how this works for you! I found it works with ultra-fine, micro, & fine glitter just great. What glitter works best? I have put glitter on some projects prior to baking and it has not worked well. Baking distorts it. So I just wait until baked, then coat the piece with a semi-gloss and sprinkle the glitter on. I use ultra fine glitters and have yet to have a problem. What is this pencil called? It’s called a “Wax Pick-Up Pencil.” You can find them all over the internet for purchase and some (not all) big box craft stores carry them too, but they are more expensive. Awesome! I have a few projects of my own that could use this treatment.